This was Isaac Hayes' second album. 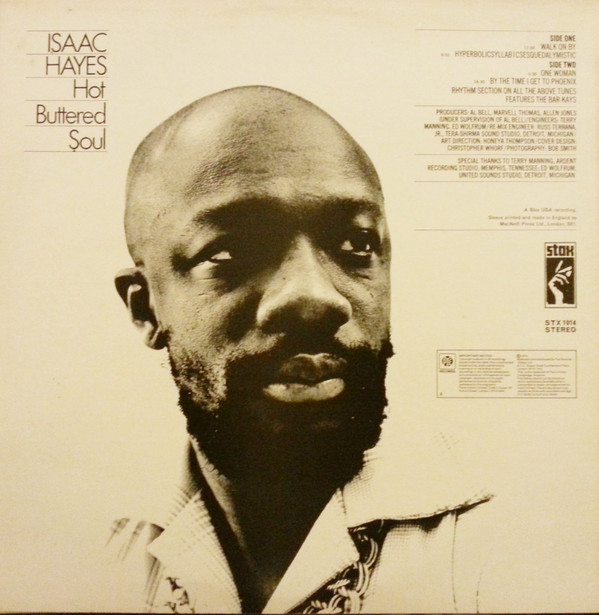 His first, "Presenting Isaac Hayes" had not been much of a success and, apparently, he demanded free reign from Stax Records to do what he wanted on this album. He sure did that. In 1969, albums featuring only four tracks of lengthy soul workouts were not exactly de riguer. In so many ways, this album blazed a new trail. Barry White was still four years away from doing similar material. The album showed that soul could be coal-mine deep, drawn-out, dramatic, funky and passionate. Hayes suddenly had a new persona - the cool, growling-voiced but sensuous loverman. Soul music changed with this release, not as obviously as with "What's Going On" or "Curtis" maybe in that it carried no social message, but certainly stylistically. "Walk On By" is Isaac's take on the song made famous by Dionne Warwick. This ain't nothin' like that, brother. 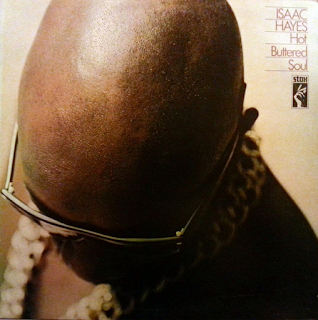 It is a slow burning, slow building, smoocher of a groove that features, as well as Hayes' deep, late night vocal, some searing guitar. It really crashes in at the end of its twelve minutes and the only downside is the slightly disconcerting bit where the volume goes up and down and you think there is something wrong with your system. "Hyperbolicsyllabicsesquedalymystic" is superbly funky - full to the brim with big, fatback bass, thumping drums, clunking piano, seductive backing vocals and Isaac grunting here and there. It gets into its groove and just keeps going, marvellously. It also, clearly, qualifies as one of the longest song titles and one of the most non-sensical. "One Woman" is a delicious slice of "come over here honey" soul. The original recording always had a scratchy bit at about 2:50 seconds. Even the remastered version I now have has not failed to eliminate this. No real matter though, when Isaac and his backing singers trade off vocal pyrotechnics as the song reaches its glorious denouement. "By The Time We Get To Phoenix", written by Jimmy Webb, made famous by Glen Campbell, is the album's tour de force. It is over eighteen minutes long and features an extended preacher-style spoken introduction from Hayes telling us all about the song's protagonist's back story to the song. A subtle bass rumbles as Hayes narrates until over the eight and a half minute mark. At that point he soulfully and effortlessly leads into the song. The song reaches a climax with some excellent horn backing and the band gets louder and louder.